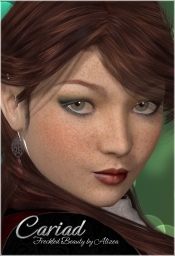 Cariad Freckled Beauty for V4 | Alizea3D – the virtual tailor ! A Face Without Freckles Is Like A Night Without Stars ! So let me present you Cariad , a delicate beauty who has as many freckles on her skin as there are stars in the sky ! Cariad is Welsh for love, sweetheart – so let her delight your heart with every render ! 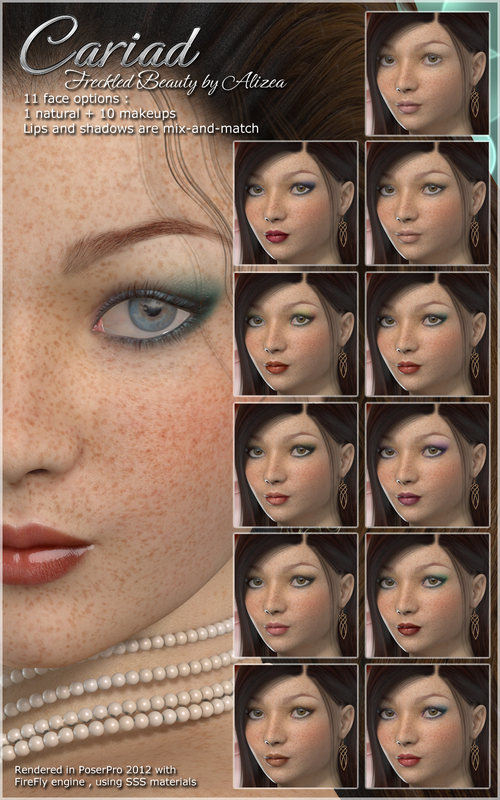 Cariad Freckled Beauty is a complete character package for V4.2 . Her face is a custom sculpt, requiring no morph packages to use . Cariad also comes with a body injection pose to create her svelte figure , using the Morphs++ and Elite Shapes morphs . 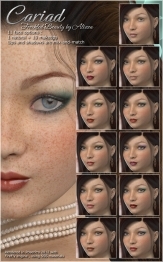 Cariad for V4.2 has 10 makeup options + 1 natural skin. She gives you the choice between 11 lip colors and each of those lipstick options has four levels of lip gloss to select from as well : matte , moist , satin and gloss. Along with the makeup selections, she has 8 realistic and unique eye colors and 6 subtle brow colors choices to compliment them . Please note that ALL Cariad’s freckles come from her texture maps – no freckles were added via shaders !